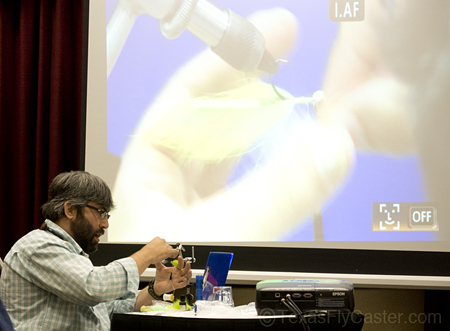 Sean Polk of Tailwaters, Dallas, demonstrates tying the “Wedding Veil” fly Monday night in Dallas, Texas. As insanely hard as it is to get from Denton to near the intersection of I75 and the 635 loop, I got there, took a seat in an empty meeting room. Once everyone started rolling in, who walked in but Sean Polk of Tailwaters Dallas! IT was a night of fly tying demos, and Sean was there to throw down his version of the wedding veil fly. Sean’s bait pattern used the most modern materials, including Clear Cure Goo, and techniques, and the fly was such a realistic representation that it provided me inspiration to try it myself. While I thought I had all materials known to fly tying, I am obviously going to have to get the list from Sean because I don’t have his magic materials. THE BULL – Now, if I were to learn one new effective pattern and call it a night – that would be a great night. However, in talking to Sean, the bonus of gatherings like these became apparent. 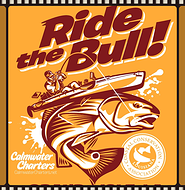 Of course we talked a little about the upcoming summer bash on August 17 at Tailwaters Dallas, but Sean also told me about a fishing tournament in Grand Isle Louisiana – the Ride the Bull Kayak Fishing Tournament. Obviously I have sworn off kayak fly tournaments, but this one, because of its location and format, and participation (kayak entries as many as 200). The rules also limit minimum size to be registered at 27-inches — MINIMUM. “The event is unique in that it is a live-weigh, bull redfish-only tournament. Several “chase” boats mill around through the hundreds of kayakers anchored up in the confined tournament boundaries of Caminada Pass; when a big red is landed by a participant, the chase boat takes the fish and puts it into an onboard tank. Tonight, it’s the Red River Fly Fishers meeting in Sherman, Texas, and who knows what will go on there?